I am a growing artist. I made the commitment this year to become a professional. I am working hard towards this goal, knowing that my art has something to offer to the world. I am reporting on my progresses regularly, this will help me keep track of my progress. I am also hoping to be of help to other aspiring artists. I am French and live in the US, my life and my dreams are my muse. 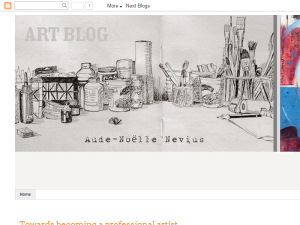 This what your Aude-Noelle Nevius - Blog Blog Ad will look like to visitors! Of course you will want to use keywords and ad targeting to get the most out of your ad campaign! So purchase an ad space today before there all gone! If you are the owner of Aude-Noelle Nevius - Blog, or someone who enjoys this blog why not upgrade it to a Featured Listing or Permanent Listing?